National Oil and Gas Plays: Where’s all our energy? Eagle is a national provider of land services and can support oil and gas, wind or solar energy companies throughout the United States with their land needs. The Green River Formation of Colorado, Utah and Wyoming holds the equivalent of 800 billion barrels of recoverable oil, according to the Bureau of Land Management - more than the total oil reserves of Saudi Arabia. The southern portion extends into the Piceance Creek Basin. More than 70 percent of the formation, including the richest and thickest oil shale deposits, lies under federally managed lands. The government has a role in determining the future of the U.S. oil shale reserve, and it is taking steps to support exploration and production in this resource. North Dakota and Montana have an estimated 3.0 to 4.3 billion barrels of undiscovered, technically recoverable oil in an area known as the Bakken Formation, part of the Williston Basin. Horizontal drilling and hydraulic fracturing technology are generally credited with opening up this play, and companies are now aggressively extending the play into other parts of the Basin. The Bakken Formation straddles the Devonian-Mississippian boundary and is one of more than 20 oil and gas producing formations in the Williston. The Powder River Basin is an area of 14 million acres in northeastern Wyoming and southeastern Montana. In 2002, the USGS estimated a mean of 16.5 trillion cubic feet of undiscovered gas, a mean of 1.5 billion barrels of oil, and a mean of 86.5 million barrels of total natural gas liquids. The Mowry TPS is estimated to contain a mean of 198 million barrels of undiscovered continuous oil, and the Niobrara TPS is estimated to contain a mean of about 227 million barrels of undiscovered continuous oil, together representing about 27 percent (424 million barrels) of the total mean undiscovered oil in the province. The D-J Basin spans Eastern Colorado, Wyoming, Nebraska and Kansas. Oil and gas have been produced in the Denver Basin since 1901. The Wattenburg Field, just north of Denver, is considered a “giant” field with more than 4 trillion cubic feet of natural gas reserves. In 2007, this field also produced over 11 million barrels of oil. The D-J Basin has over 20,000 producing oil and natural gas wells, with some of the largest producers including Anadarko, Chesapeake, Noble Energy and EnCana. The Permian Basin covers 23 counties (mostly in Texas) in an area roughly 300 miles long and 250 miles wide, and is one of the oldest oil and gas fields in Texas, dating back to 1921. Even today, the Permian accounts for nearly 15% of the nation’s crude oil supply. New assets are still being discovered and developed; in September of 2010, the University of Texas awarded lease rights for 123,000 acres to El Paso EP. Other active producers in the Permian include Chesapeake Energy, Anadarko, Pioneer Resources, Occidental Petroleum, Devon Energy and Apache Corporation. The Granite Wash sandstone reservoir lies underneath the Texas panhandle and western Oklahoma, covering over 4,500 square miles, with natural gas generally found in layers from 11,000 to 13,000 feet. There is some oil production, primarily in Oldham and Gray counties in Texas. There are over 2500 wells providing good rates of return, explaining the level of interest from producers such as Apache, Chesapeake Energy, Linn and Forest Oil. The Eagle Ford shale formation is located below and is the source rock for the Austin Chalk and the supergiant East Texas Field. Extending from the Mexican border to East Texas in a swath about 50 miles wide and 400 miles long, the Eagle Ford depth ranges from 2,500 ft deep in the northeast to 15,000 ft in the southwest, with much of the industry concentrating on the liquids-rich portion of the play, however significant quantities of natural gas remain. 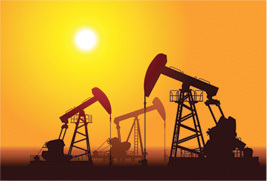 According to the Texas Railroad Commission, through August 2011 over 8 million barrels of oil have been produced (more than twice 2010’s total production) and over 139 BCF of natural gas (a similar rate of increase). Nearly 3,500 drilling permits have been issued through August 2011. Active producers include Anadarko, Apache, Chesapeake, ConocoPhillips, Exxon, Pioneer, Petrohawk and Shell. This basin in Texas includes the Barnett shale and covers nearly 5,000 square miles, including 17 counties. Estimated to contain as much as 30 trillion cubic feet of natural gas, the Barnett is the most active shale play in the United States, and is known as the place where hydraulic fracturing technology and horizontal drilling techniques were perfected. The Fort Worth Star Telegram reported over 100,000 leases recorded in Tarrant County in 2007. Some counties have reported 100% success rates on completed wells, and some advocacy groups claim the Barnett may be responsible for creating more than 100,000 jobs. The Mississippi Lime is located in Northern Oklahoma and Southern Kansas, underlying an area of approximately 6.5 million surface acres. Lying above the well-known Woodford play, the Mississippian is proving to be economical to drill using newer horizontal drilling techniques combined with fresh water fracking, with good payback. Liquids are containing from 40% to 55% oil and gas. The layer is porous enough that producers can utilize plentiful lower pressure and lower cost equipment, not strong enough to work in the tighter shale plays. Range Resources, Chesapeake, SandRidge, Chaparral and Eagle Energy are some producers active in the Mississippian. The East Texas Oil Field, also called the Woodbine Formation, covers 140,000 acres across five counties, and is the largest oil field in the United States outside of Alaska in terms of the volume of oil recovered. Since it’s discovery in the early 1930s, it has had over 30,000 producing oil wells, producing more than 5.2 billion barrels of oil. Recently a new area has been identified across Madison, Leon and Grimes counties being called the “Lower Woodbine”, that may be equivalent to the lower Eagle Ford play in scale. Producers exploring this new play include Chesapeake, Apache and Gastar. With enough oil and gas to potentially become a major unconventional hydrocarbon reservoir, the Woodford is a viable play. Located in Southeastern Oklahoma, the Woodford is a promising source of natural gas. “It compares favorably to the Barnett Shale in terms of organic content (6% to 8% versus 4.5%), per-well production rates and reserve sizes,” according to a report from Morgan Stanley. Total in-place gas in the Woodford Shale is on the order of 830 TCF and total in-place oil is on the order of 250 Bbbl. The Haynesville is the fourth largest natural gas shale formation in the world, lying below East Texas and Northwest Louisiana, and extending into Arkansas totaling some 9,000 square miles of land area. Some reports indicate that the Haynesville could be larger than the Barnett shale play, with the shale generally running at depths from 10,000 to 14,000 feet. Producers estimate that the Haynesville could hold as much as 245 trillion cubic feet of natural gas. Depressed natural gas prices in 2011 have prompted some producers to reduce rig count and drilling activity, but recent improvements in completion costs have prompted other companies like Anadarko, Encana, ExxonMobil, Forest Oil, GMX, PetroHawk, and PetroQuest to continue exploration. The Tuscaloosa marine shale extends from southwestern Mississippi to southeastern Louisiana. Preliminary evaluations from a 1998 LSU report indicate the Tuscaloosa marine shale may contain a potential reserve of about 7 billion barrels of oil. A small number of conventional wells have been producing for years in the area, but new horizontal drilling techniques could maximize production and allow the field to become commercially viable on a larger scale. Producers owning and exploring significant acreage include Indigo, Denbury, EnCana, Amelia Resources and Goodrich Petroleum. The Fayetteville shale region produces natural gas in the Arkoma Basin, primarily in Arkansas. Covering about 4,000 square miles, this play was overshadowed by the giant Barnett shale and other more liquid rich areas, but a number of producers have stayed with excellent results. Research indicates that the area may contain up to 20 trillion cubic feet of natural gas. Companies active in the Fayettville include Southwestern Energy, XTO Energy, Petrohawk and Petroquest. The Illinois Basin, as of 2009, has produced over 9 billion tons of coal and over 4 billion barrels of oil. The latest wave of oil exploration produced a peak of 140 million barrels in 1940, after which production declined. Much recent drilling activity has targeted shale gas in the Devonian-Mississippian New Albany Shale. According to the Illinois Basin Consortium, the New Albany Shale includes some 53,000 square miles and is estimated to contain 86 trillion cubic feet of gas. The Antrim Shale lies in the Michigan Basin, encompassing approximately 39,000 square miles and extending into Ohio and Indiana. While natural fractures exist, most of the shale is being tapped using hydraulic fracturing. The USGA National Assessment of U.S. Oil and Gas, dated 2005, estimates that over 7 trillion cubic feet of gas may be recoverable. Over 9,000 wells have been drilled through the Antrim Shale. The Black Warrior Basin extends through Northern Mississippi and Northwestern Alabama. According to the USGS survey of 2002, it is estimated that a mean of 8.5 trillion cubic feet of natural gas, 5.9 million barrels of oil, and 7.6 million barrels of natural gas liquids lie within the basin. The most prolific gas reservoirs of the Basin have been the Pottsville coal seams. As of 2009, these coals have yielded over 2.2 trillion cubic feet of gas, or roughly twice the volume of gas produced by the conventional sandstone reservoirs. The largest conventional oil field is North Blowhorn Creek Field, located in Lamar County, Alabama, producing over 6,500,000 barrels of oil as of December 2009. The Utica Shale is a layer a few thousand feet beneath the well-known Marcellus Shale, thicker and more expansive than the Marcellus. It has already proven capable of supporting commercial production. Located primarily under New York, Pennsylvania, Ohio and the Virginias, with northern edges extending into Canada, the Utica is potentially larger than any other known natural gas field. Estimates have been as high as 60 trillion cubic feet of natural gas reserves. Chesapeake is one of the producers currently exploring the Utica shale with horizontal well drilling results in the wet gas and dry gas phases of eastern Ohio and western Pennsylvania, achieving strong initial production success. The limestone layers below the Marcellus shale have trapped valuable natural gas reserves, with estimated amounts varying from 1.9 trillion cubic feet (United States Geological Survey, 2002) to 262 trillion cubic feet (Unites States Department of Energy, 2009). Also includes the are known as Chattanooga Shale. Directional drilling is done to depths of 7,000 to 10,000 ft to reach the formation. Early results show that horizontal wells in this formation are producing gas at a rate more than double that of vertical wells, and at slightly lower cost overall, despite the higher initial cost of drilling. Companies active in the Marcellus include Range Resources, XTO Energy, Chesapeake, Chief and EXCO.